If anyone is interested in booking us for a gig, drop me an e-mail. First of all, because we all have jobs and families and other stuff going on, there aren't a lot of dates available on the calendar  but give it a try anyhow! Will play for food (low carb, please) and fun! 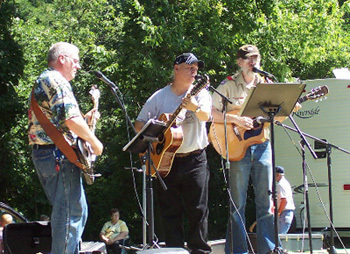 And at the Trumble Family Reuinion in August, 2005. 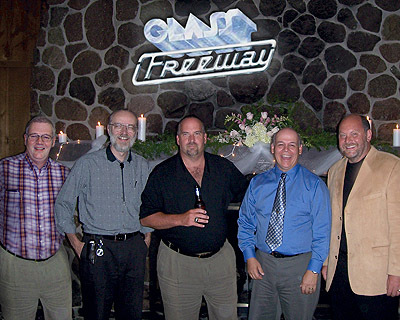 "Glass Freeway" - our old '70s cover band - is shown here sometime around 1978. 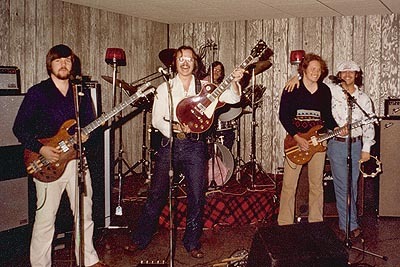 From left is Bryan Kimble, me (proundly displaying my '73 Les Paul deluxe), Todd McCord (my brother the drummer, peeking over my shoulder), Chandler Carr (lead guitar), and Doug Trumble. 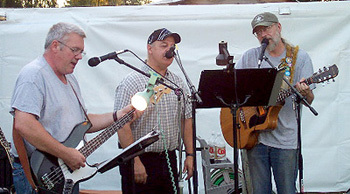 Previous to this photo, Brian Brill (keyboardist par excellence) played with the band for a year or so.